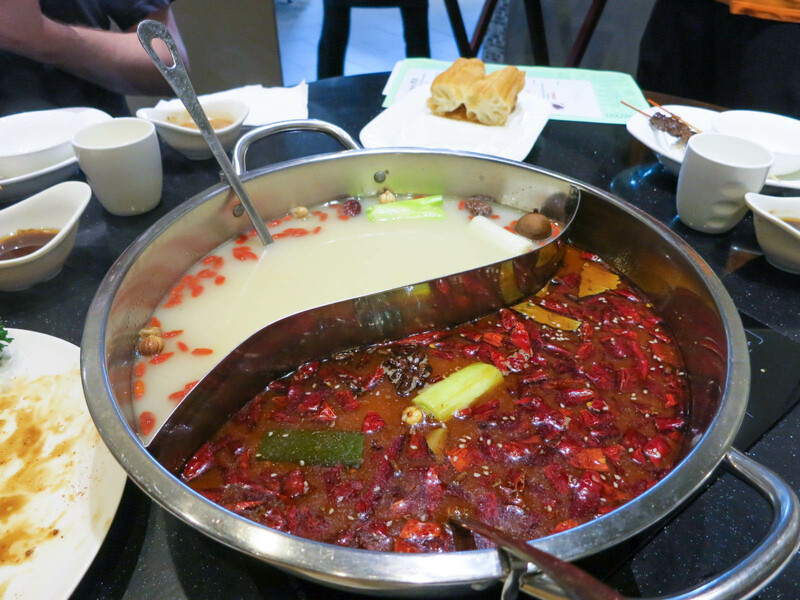 Our latest Chinese Bites Signature Dishes Tour took place at Little Sheep Mongolian Hot Pot in Burnaby. Believe it or not, but I have never had hot pot before, so I was very excited to be able to try something new. If you don’t know what hot pot is, you share a big pot of broth with your table and you cook your own food in the broth. Little Sheep is a pretty big restaurant and it was packed full of people on a Wednesday night, which is a pretty good sign. They also have a sauce bar in the middle of the restaurant where you can go up and make your own dipping sauce. Many restaurants charge extra for this, but here it is included. This was my first time trying sour plum juice. To be honest, the taste of this reminded me of a savoury barbecue sauce. I wasn’t crazy about this stuff and I preferred drinking water and tea with my meal. 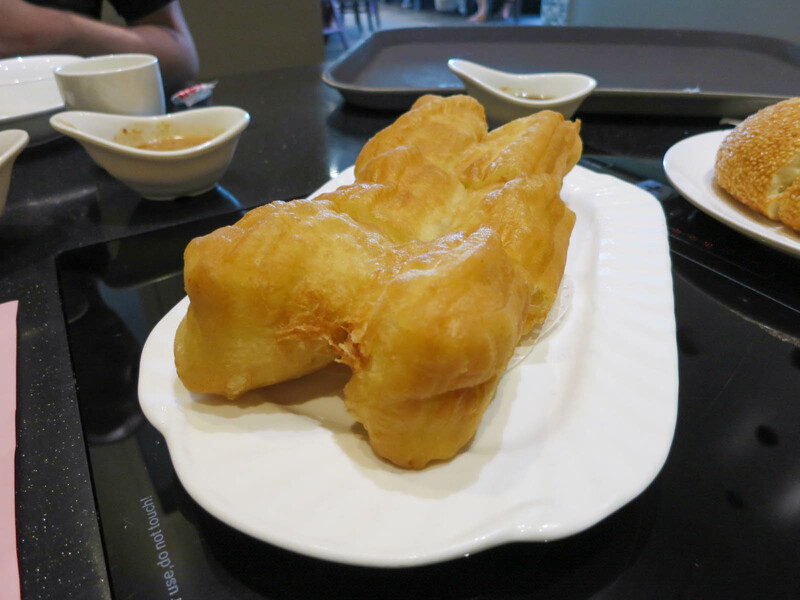 For a starer, we were served Chinese doughnuts. These doughnuts tasted really fresh and they were still warm and crispy. I’m used to eating Chinese doughnuts that come with congee, and I find those are never freshly made, so it was a nice treat to have these. 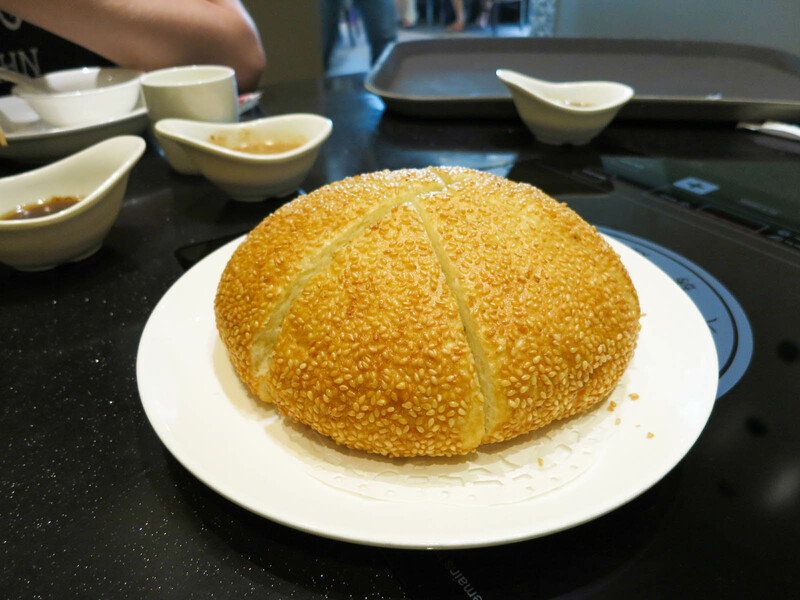 We were also served a sesame chive bun to start. There was nothing wrong with this, but I found it to be a bit boring. It was just bread covered in sesame seeds. This is too much of a filler item when you are about to eat an all you can eat hot pot meal, so I wouldn’t recommend it. We were also served lamb and beef skewers for an appetizer. The skewers were actually very good. Both the lamb and the beef were tender and juicy. They were coated in a light spicy sauce. For our hot pot both we had half and half spicy and original broth. The original broth was light and mild. There was garlic, onions, and other mild spices in it. The spicy broth packed some heat to it. I love spicy things, so I was happy that my tongue actually tingled from it. If you can’t handle spice, I wouldn’t recommend this one. I personally liked the spicy broth a lot better than the original one because it added so much flavour to everything you cooked in it. When you eat hot pot, you have to eat tons of meat and seafood to get your moneys worth. 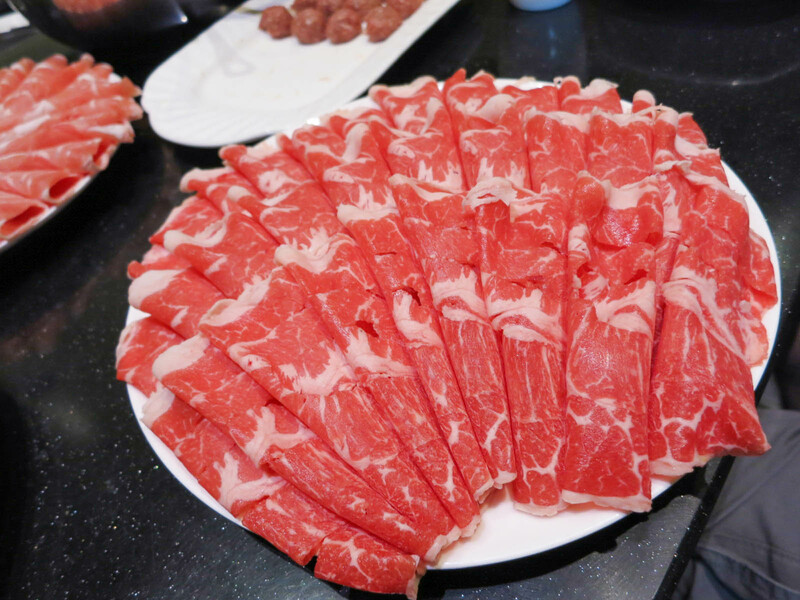 I loved the thin slices of meat. The rib eye beef was nicely marbled and stayed very tender after cooking. I also enjoyed the sliced lamb and I thought it had a great meaty flavour to it. 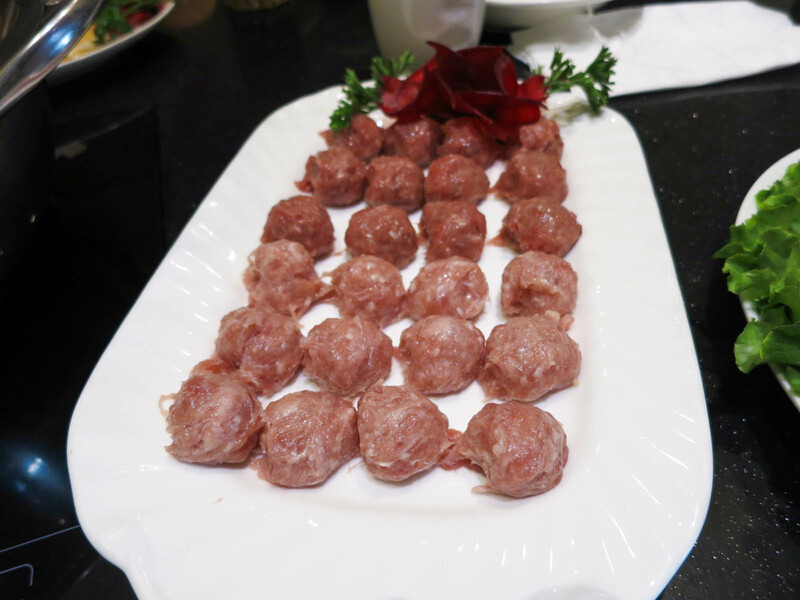 Meat balls are another staple of hot pot. I really enjoyed all of them and I liked the juicy and bouncy texture they had. I’m not going to put pictures up of everything we ate because that would be too much and to be honest, the plates of food aren’t that nicely presented. Some of my other favourite things not shown were fish balls, spinach, dumplings, and frozen tofu. I really enjoyed this meal and I am glad I finally got the chance to experience hot pot. I thought all of the ingredients here were high quality, especially the meat. I’m sad that it took me this long, because it is a fun dining experience. Yes, for good hot pot in Burnaby.